Let me just warn you that this post will be random because I should have blogged on Friday. 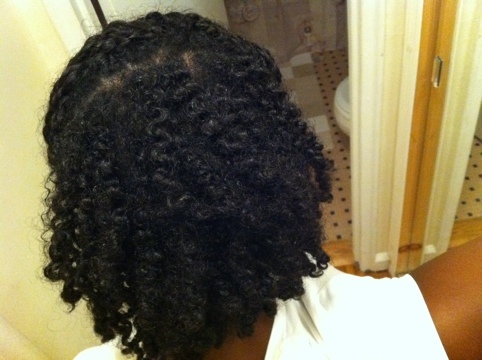 On Friday, I planned to untwist my hair and wash and condition it with some of my new products. If you remember, I two strand twisted my whole head and left it in for a whole week! I oiled my hair every day (sometimes twice a day) with my olive oil mix. 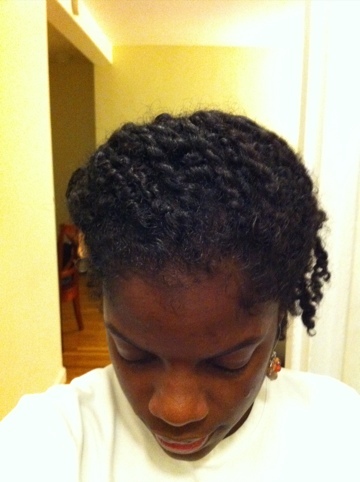 So, I came home and pre-poo’d with Coconut oil, but then decided to go out, so I left with my oily twists. When I returned, I decided to use Wen – Sweet Almond Mint Cleansing Conditioner. I liked the way it felt in my hair. It didn’t feel like it stripped my hair of moisture. They suggested leaving it in for a few minutes, which I did. The only thing I don’t like/agree with is that there’s no conditioner. When I try a product for the first time, I go by the directions on the bottle. Because of this, I didn’t condition my hair again after I rinsed out the Wen. Wen is very creamy and I guess it would be similar to co-washing your hair, so it didn’t feel like it needed conditioner on top of that. The smell is delicious and the mint makes your scalp tingle. Nice experience. I just twisted my hair for the night and wore a twist out on Saturday. Today, I’ve decided that I’m going to revisit a style I did when I had long hair. I think my hair is long enough now for it to work. In order to prepare my hair for the style, I washed it, this time with DevaCurl – Low Poo. I like to start off with clean hair for my styles because I know I plan to keep it in for the week. Can I just say that I love this DevaCurl – Low Poo. It lathers so much more than I expected and it didn’t strip my hair either. The only thing I didn’t really love is the smell. It smelled like Crazy Glue at first! LOL. I then conditioned my hair with Aubrey Organics – Honeysuckle Rose Moisturizing Conditioner. I’m currently sitting with the conditioner in my hair (it’s been at least 2 hours) and I already know it’s going to work like a charm. This is probably one of this thickest conditioners I’ve used. It was so thick I had to look at the ingredients on the back. It feels so moisturizing. Now I see why it is so highly recommended. I’m all into no/low maintenance styles and moisturizing now, so I’m going to douse my hair in my olive oil mix and bun it for the week. I need to see hair growth by December. My vision is shoulder length hair (all around) by then. Here’s my untwisted hair. It lasted pretty well for the week. Of course it’s not as neat and when I first twisted it, but it sure kept me from playing in my hair this week. Not to mention, it saved me a truckload of time in the morning! YOur curls look nice! They are definatly poppin!